This formula is also available in a version without iron. Nature’s Sunshine Super Supplemental Vitamins and Minerals provides nutrients essential to diets that are heavy in processed foods or in periods when the body is stressed or trying to heal. Packed with minerals, vitamins, amino acids, herbs, fruit powders, veggie powders and other nutrients, it supports the cardiovascular system, the respiratory system, and the digestive system. 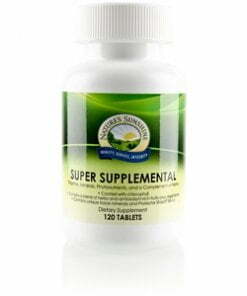 Super Supplemental also supports female breast health and eye health.